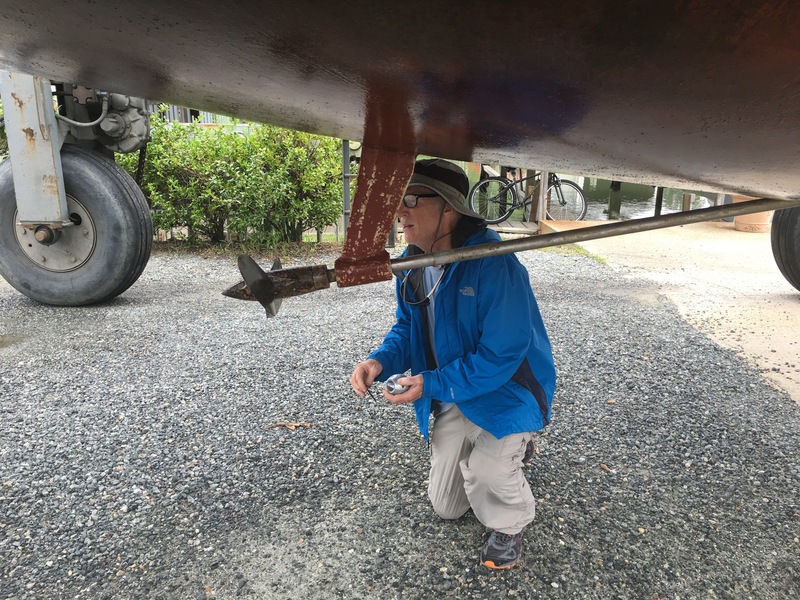 We had a good time, absorbed a lot of history, met a lot of new people, and learned much about sailboat maintenance and cruising. We sailed/motored ~1400 statute miles over a 10 week period. 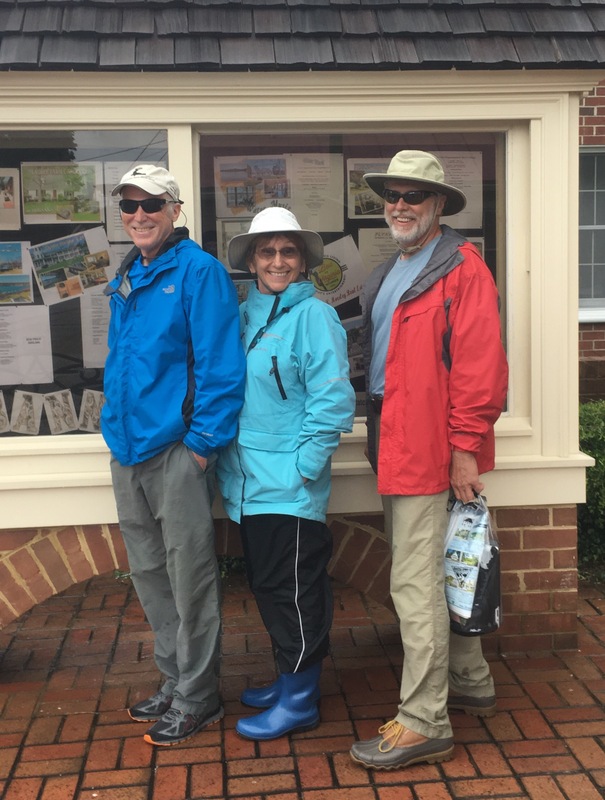 The itinerary was from Charleston SC-Southport-Outer Banks-Norfolk-Washington DC, Solomons Island-East side of Chesapeake Bay, etc. and many ports in between. Probably the most favorite parts of the trip for me were navigating the Potomac River and spending time visiting the sites in Washington DC. However, our time spent on the York River visiting Yorktown and Jamestown were a close second. We did have to rent a “land dinghy” from Enterprise to easily access these latter places. 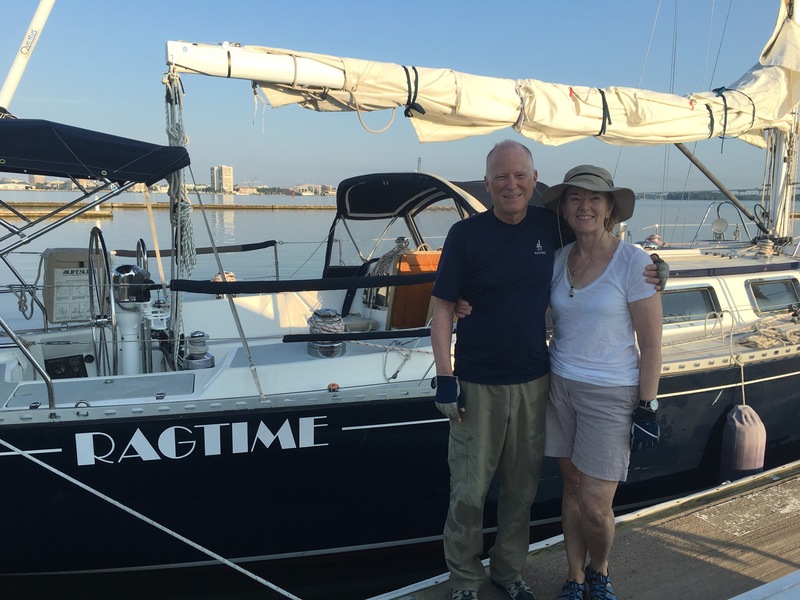 Ragtime is now safe in her new home, New Bern, NC (Northwest Creek Marina). We will miss Charleston SC and the shorter trip to the boat, but New Bern is much more affordable. Being retired gives us more time than money! July 1st fried us, and today we are drenched. Weather is a huge factor when cruising, but you have to learn to roll with it or you will hate this lifestyle. Friday we left Deltaville after 4 days docked having boat repairs. 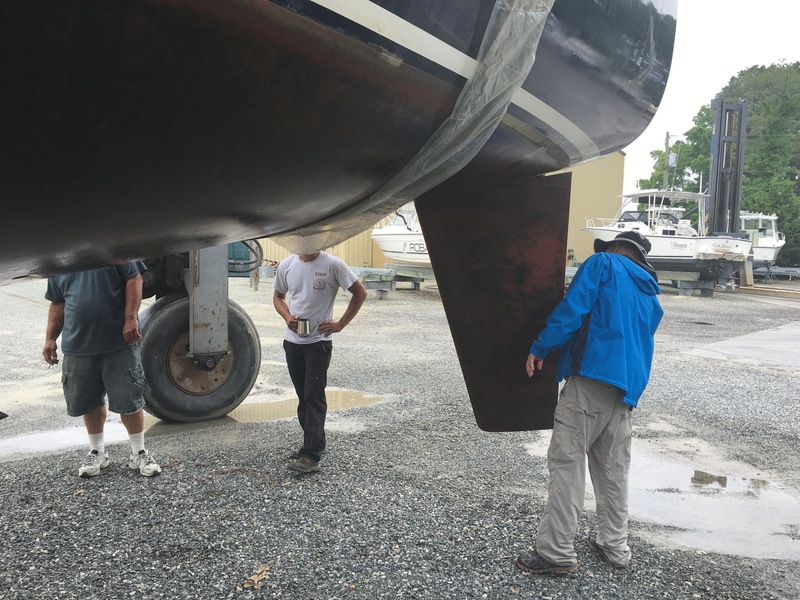 Our anchor light had to be replaced and while we were at the travel lift, we had Ragtime pulled to check her bottom. We had not seen this view since 2009 when we first saw her on the hard in New York. Even I am amazed at the immensity of a sailboat out of water. For my non sailing friends, I thought you would find the bottom interesting. While in Deltaville, we did laundry, bought groceries, ate lunch ashore, and spent money at West Marine all thanks to the courtesy vehicle from Deltaville Yachting Center-great marina and nice folks. Friday afternoon we anchored in Carter Creek beside The Tides Inn. The Tides is where Jacob did his externship through Le Cordon Bleu several years ago. The inn was built in 1947 and caters to upscale families. We dinghied ashore for a late lunch at the poolside restaurant. Dinner prices were more than we wanted to spend plus the heat and humidity was horrible on Friday. I was drenched in sweat and couldn’t even contemplate the idea of dressing up for dinner! We had a huge thunderstorm that we had to ride out that afternoon which cooled things off considerably. 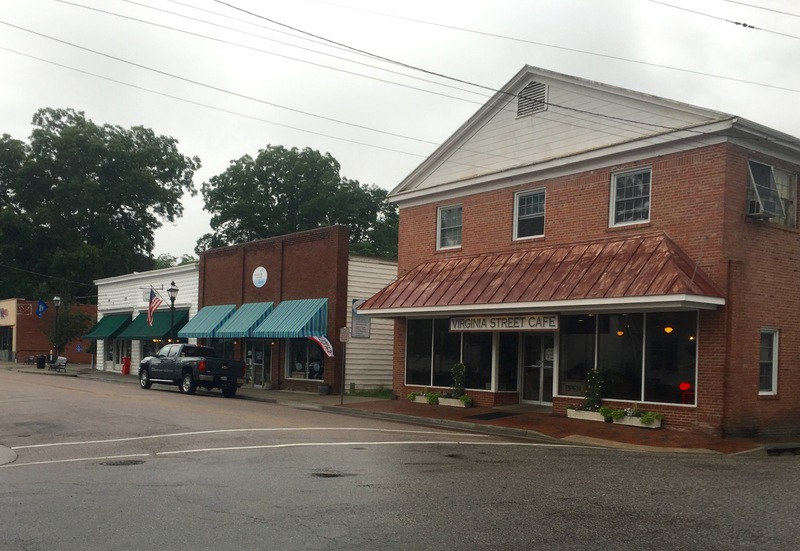 Saturday we left for Urbanna, a little town of about 500 further up the River from Irvington where the Tides is located. For the first time on this trip weather and wind cooperated. We were able to sail with both sails. There was enough wind, we eventually needed to reef. 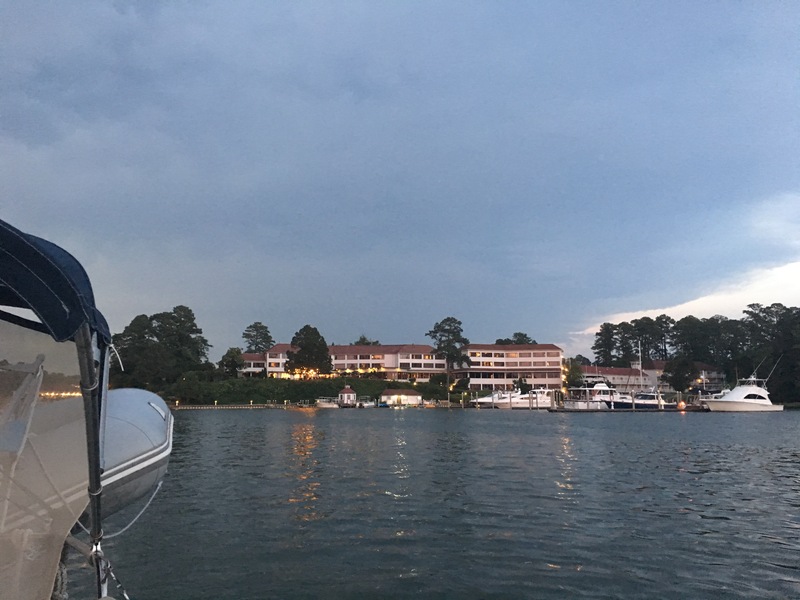 We lucked into a fabulous Independence Day celebration that evening complete with boat parade and fireworks! I’ll have to post these photos later when I can download from my camera. Yesterday it rained all day. 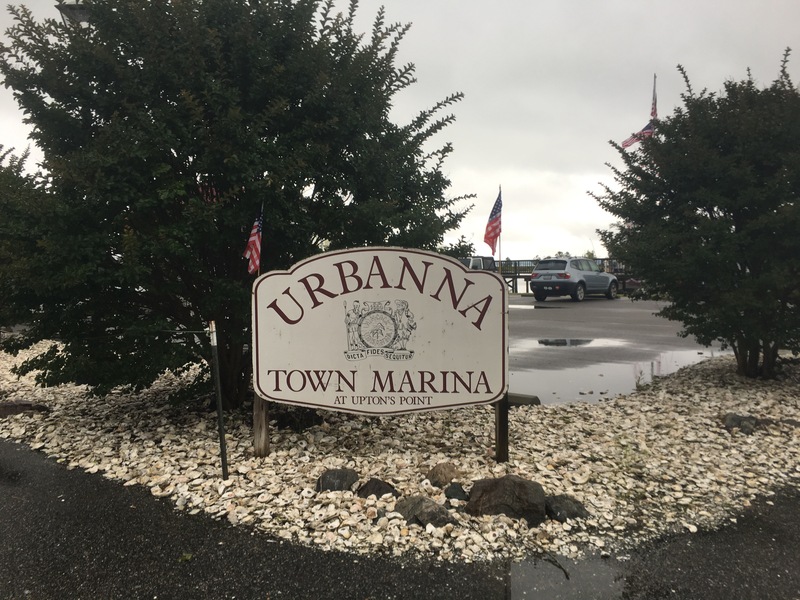 Finally we gave up, donned our foul weather gear and went to town to check out Urbanna. What a nice surprise. Glad we did but unfortunately it was so late in the day most of the cute shops were closed. We did manage to find a great little BBQ restaurant that also served great desserts. We all had coconut rum pie except for James who had his chocolate ice cream. 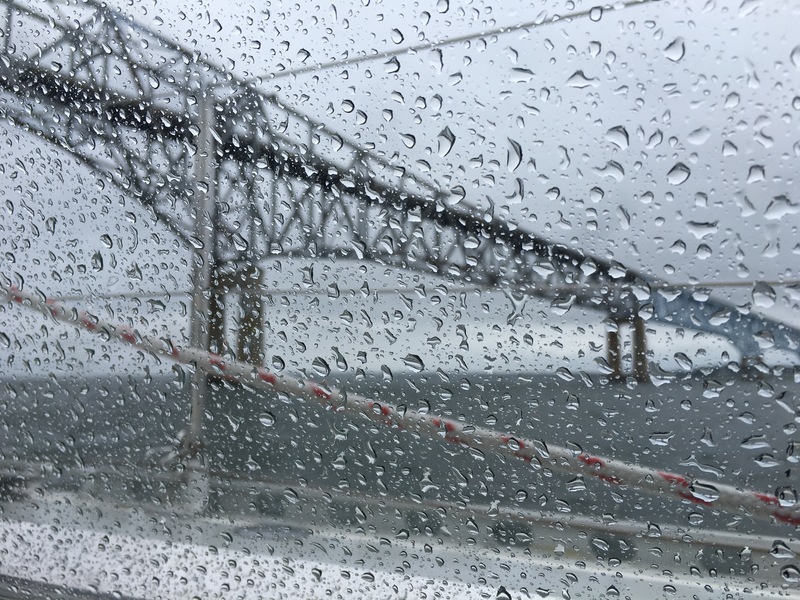 Today it is still raining, and we are motoring north to the Great Wicomico River for an overnight anchorage. It’s barely 70 degrees and cooler than that in the wind. Can hardly it’s July 4th!!! I am making deviled eggs, hotdog chili, baked beans and hotdogs for supper. I had hoped to find a watermelon to make our meal complete but brownies will have to suffice. We’ve been gone less than three weeks, and my body looks like I’ve been on Survivor! 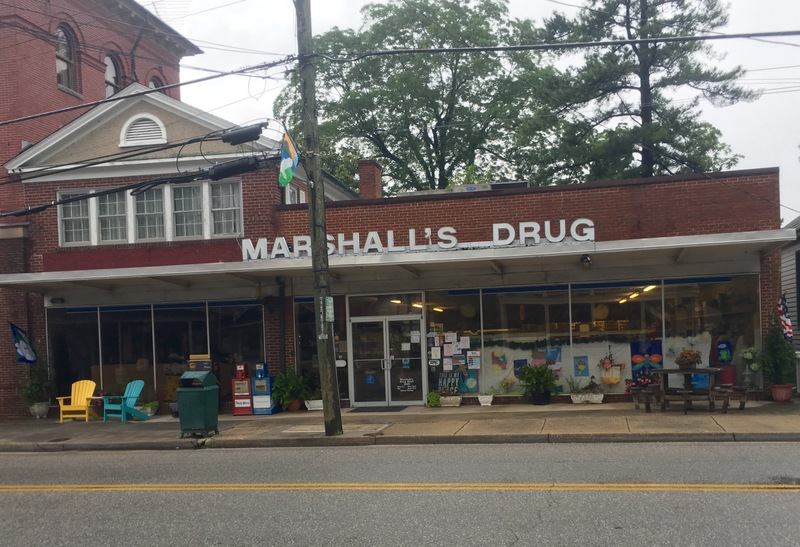 The first week I managed to trip on the marina sidewalk in Oriental, NC coming away with a badly skinned knee, palm, ankle along with accompanying bruises. Next came those horrible green headed biting flies and mosquitoes. The mosquito bites itched, but the fly bites hurt! Adding to the bruises and scabs were red welts on the ankles and other random body parts. To add insult to injury I missed a step in the cockpit and fell just missing my skinned knee but succeeded in banging up my other one along with pulling my left arm. Oh,and I must not forget hitting the top of my head on the boom. Thank goodness for Advil and Tylenol. I am truly grateful that I’ve not broken anything. There’s always something to be thankful for. Quite a few years ago, we took a dear friend who is no longer with us on a sailing trip. One of the mornings as I was pulling my hair up into a ponytail and cramming it under my cap, he remarked, “Sailing isn’t for beautiful people.” I didn’t know whether to be offended or to consider it a compliment as to my love and dedication to the sport. 🙂 I always think of my friend Dave on days like today. 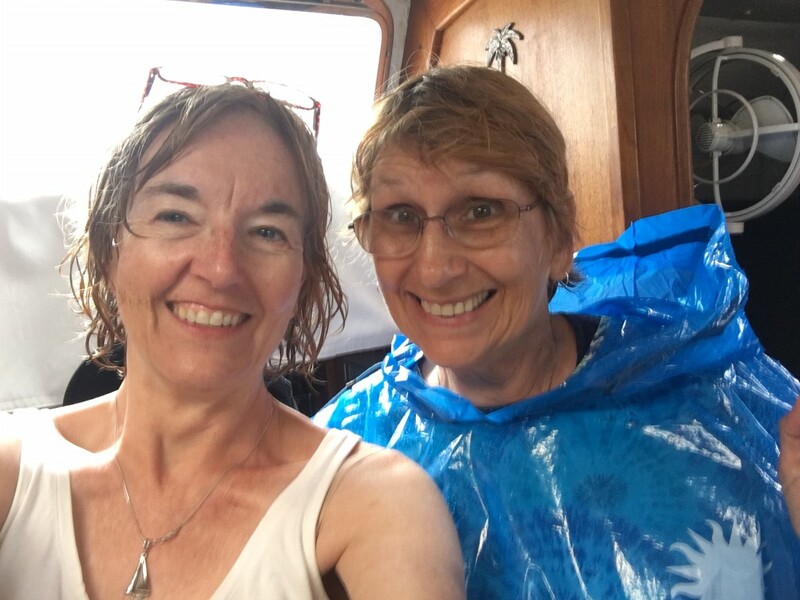 We walked over a mile from the American History Museum on the Mall to our boat at the marina in pouring down rain with only a museum plastic poncho. Sailing is not for the “beautiful people” or high maintenance, but it is always interesting. I mostly cook what I do at home except for baking cakes (although my fellow sailor friend is baking cake mixes and I did bring a mix). 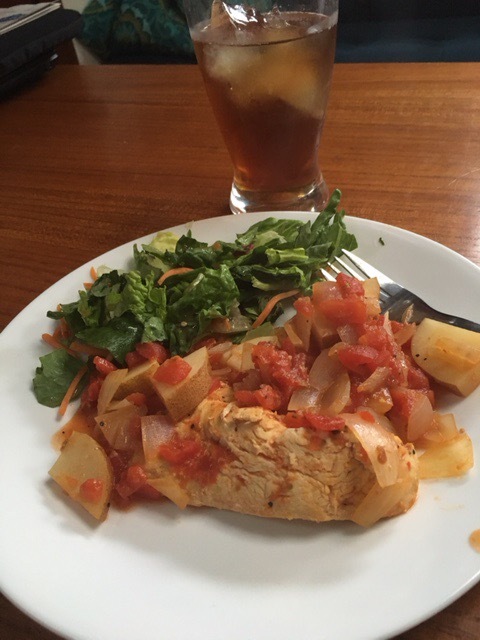 We are actually eating healthier because amazingly we are eating out less than at home, and I purposely have bought less junk food and more fresh fruits and vegetables. First of all we do not have a microwave, and I do not miss it at all. I cook on a three burner with oven propane stove. We only have two electrical appliances-small coffee maker and a vacuum food sealer that I use when we have shore power. I toast in a non stick fry pan with a little butter. At sea I brew coffee in a French press. My can opener is a Pampered Chef manual that I also use at home. It’s truly amazing how few gadgets one needs to cook a delicious meal. Weather plays a role in my meal planning. On cold days I bake bread, cook casseroles, and roast meats. On hot days I avoid the oven if at all possible. 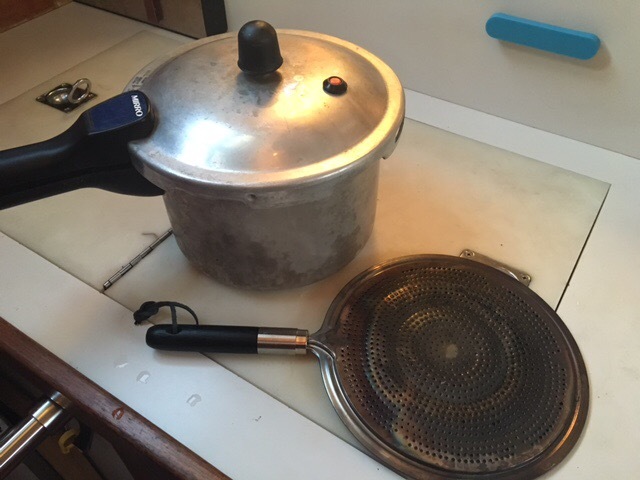 I have discovered two “how on earth have I survived without” items-a pressure cooker and a heat diffuser. 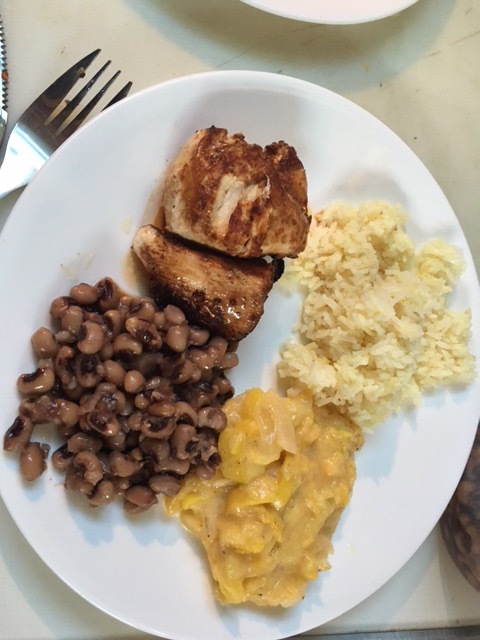 The pressure cooker allows me to cook food faster which equals less propane and more importantly less heat! The diffuser is placed over the burner and diffuses the heat enabling simmering which is hard to do on the propane burners. I had read on sail blogs and groups about cooking with a pressure cooker and how I should have a diffuser. My pressure cooker dates back to the days of S & H green stamps! I only use it at home to cook black eyed peas and hotdog chili. Thanks to Google and a pressure cooking cookbook, I can now bake potatoes, cook rice, and have plans to cook a roast. The baked potatoes were fluffy with tender skins and only took 20 minutes to cook. I may continue to cook them this way at home. I kept meaning to search the Internet for a diffuser before we left but forgot with the myriad of other details needing to be done. As luck would have it, I stumbled upon one in a hardware store in Oriental, NC while James was shopping for bolts for one of his boat projects. It was only five bucks! We docked in Southport Marina Friday morning around 10 am. We were greeted with muggy hot sunny weather. After little sleep I was somewhat grumpy as the sweat trickled down my back while we hooked up power cord, tidied the dock lines, and stowed equipment. Thankfully our blessed little A/C chugs away once we have shore power. The best improvement we made to Ragtime! After a nap and shower, we had dinner with friends from Watauga Lake Sailing Club. Jennie and Kevin now live in Wilmington, NC. 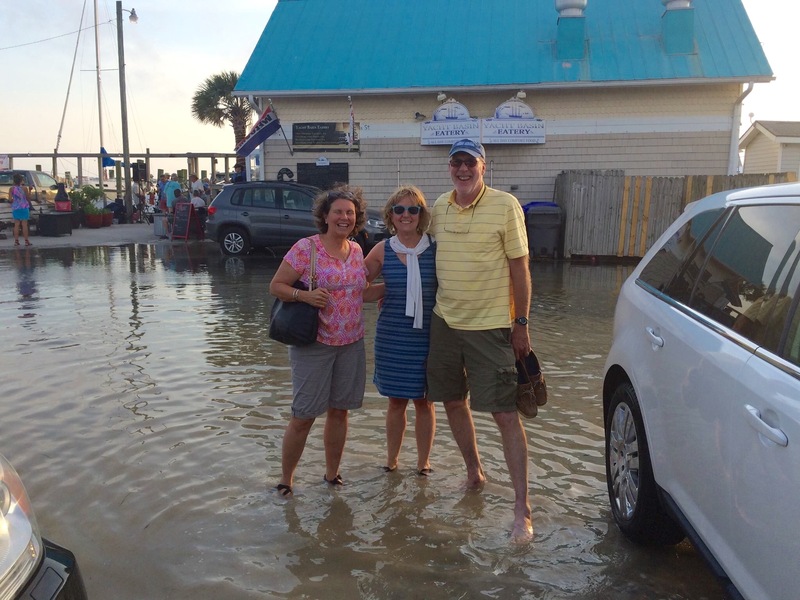 It was good to catch up even if we did had to wade to the restaurant through the high tide waters. 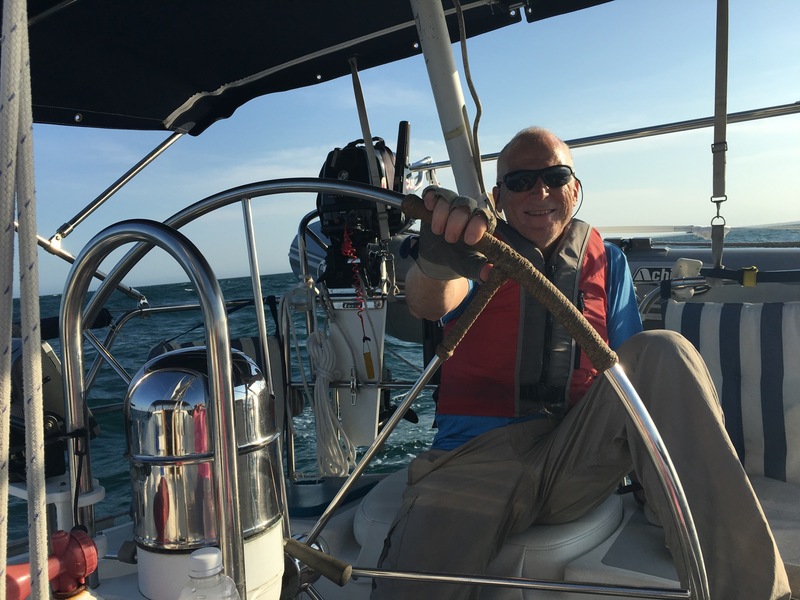 James advises to always check tide charts whether on or off boat! Saturday we left Southport, motored up the Cape Fear River to Snows Cut to the ICW. 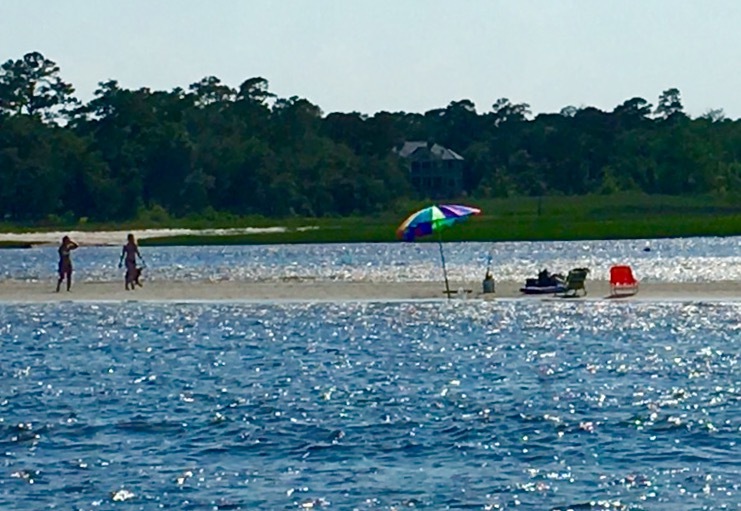 We saw very shallow water and you don’t need the GPS to tell you how shallow when you see beach umbrellas in the middle of the waterway! Fortunately we didn’t need Tow Boat US’s services, but they seemed to be busy enough without us. At 6:15 pm we motored out of Masonboro Inlet into the ocean for another overnighter Overnighters can be as different as night and day We had a nice breeze and little waves on Thursday night which meant more sleep and a relaxing night of reading, listening to podcasts, light snacks, and star gazing while on watch. Saturday night was hard from the get go. The ocean swells were large and random which made for a rocky ride with 15 knots of wind steady. We only sailed the jib reefed. I kept thinking this was going to be the night I got sick. I’ve only been seasick three times in over 30 years of sailing. Before leaving Southport I had cooked chicken and noodles for supper with plans to reheat for supper. We ate it cold which really wasn’t too bad. I catnapped during my off watch, but it wasn’t restful with my body constantly moving. Moving around was an ordeal, and I found myself slammed against the boat quite often with the bruises today to prove it. Non-sailors think we are courageous and/or crazy. We think it’s just part of the sailing life and as in life, there’s the highs and lows. Without the mix, life would be mundane and we couldn’t truly appreciate the good times. So it is for the life of a sailor. Look at this man’s smile. Sailing energizes him in the way that nothing else does and that energizes me. Our long awaited retirement sail trip got off to a rocky start. James had planned to retire the end of 2015, and then to our fortunate surprise Eastman offered an early retirement incentive package that included a years salary! The only downside was he couldn’t retire until March 1, 2016 which was a very slight change of plans as we had hoped to maybe leave early April. 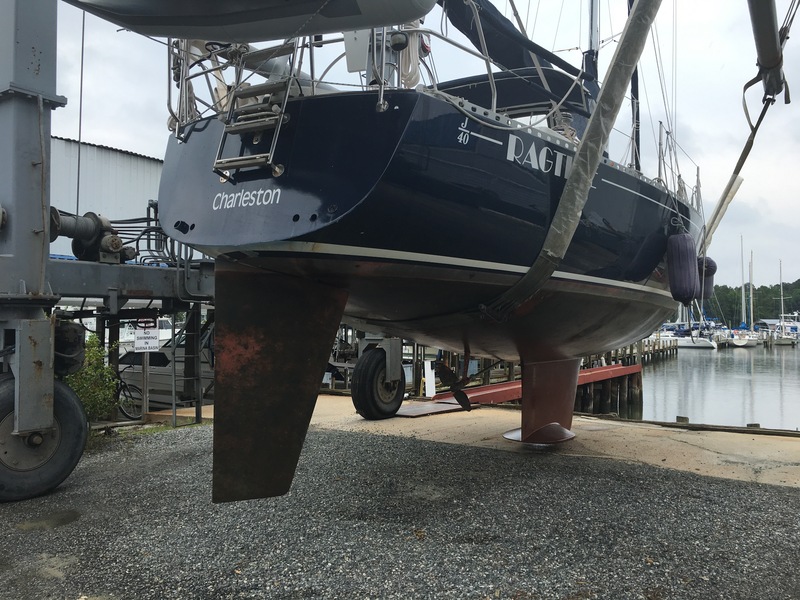 Since we had boat projects to complete, we decided to race one last time in Charleston Race Week with May 1 being our leave date which also corresponded with the end of our marina lease. 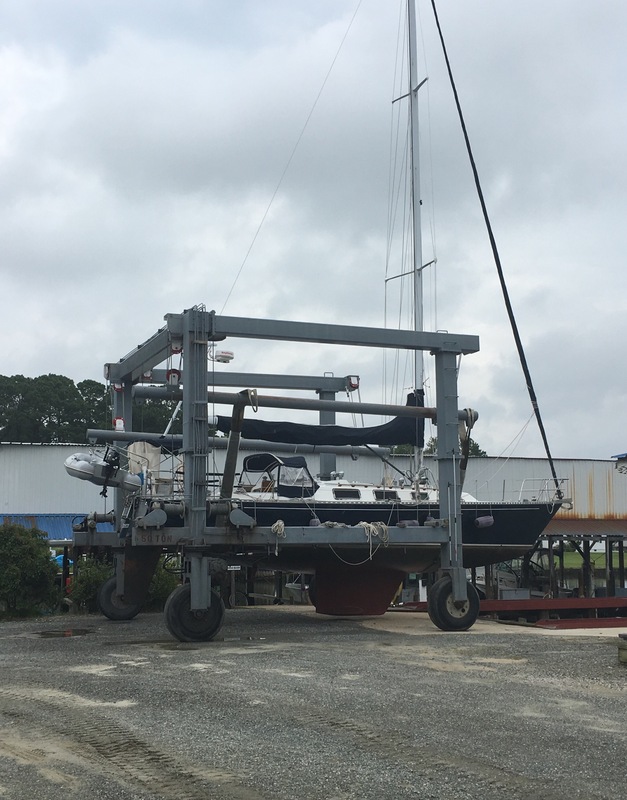 After several trips to Charleston prepping Ragtime for our extended trip came to a brutal halt when mast troubles were discovered the first day of the races. We feared a new mast was in order which sent us home quite distressed. fortunately it was our standing rigging which ended up being a much easier fix. Still we had lost ground time, because we had put the other projects on hold. It was not meant for us to leave the first of May. We extended our lease for a month and mentally prepared ourselves for another month wait. One of my dearest friends lost her father in May. I was eternally grateful to have been here for her. Another dear friend was buying a house which meant I was able to participate in the process with her. And I was able to celebrate my 60th birthday on May 6th with my closest friends. The whole delay has been a growing experience for me as I have practiced living in the moment. It was a constant reminder that plans are just that-plans. 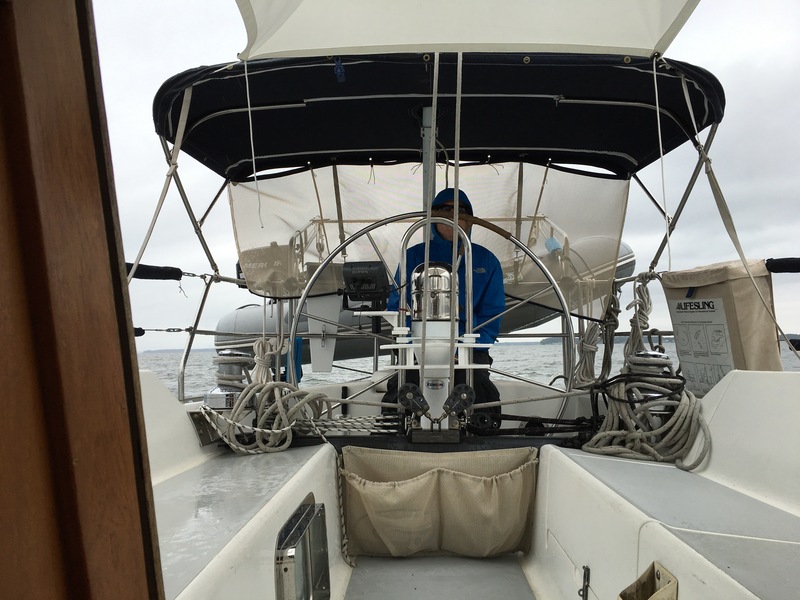 Life on a sailboat is a phenomenal learning laboratory for Type A people like us. We need it! Tuesday, May 31 was about new leave date. Month lease was up, weather looked good as Bonnie had moved inland and we were stocked and essential projects were done. Except the engine mount that was to be delivered on Tuesday did not arrive until Wednesday. But the delay meant having some Charleston friends over for drinks and goodbyes and being a tad more rested for the overnighter. I am writing this on my IPad sitting behind the wheel of Ragtime as autopilot steers with fine tuning of the sails by James. We are clipping along at about 6 knots. We should make Southport, NC by mid morning. 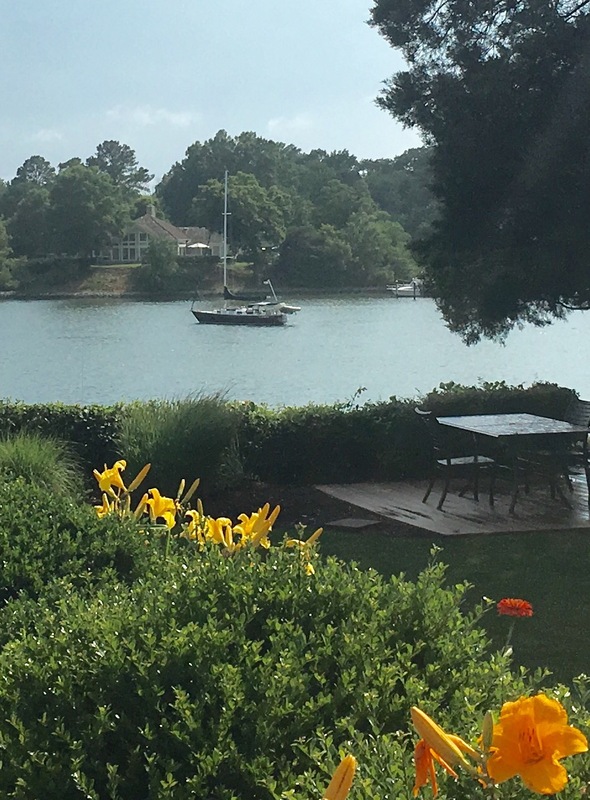 We have a marina slip reserved for Friday with plans to visit with some friends from our sailing club back home. Did I say plans?